We all love our gadgets and gizmos, don’t we? So here’s a mobile messaging device, iKIT introduced today by IMOVIO, an alternant to your smartphone or mini-PC. A stylish accessory, the iKIT is a portable clamshell device with some great features at a really affordable price. A Pocket Mobile Companion with dimensions of 95mmx65mm and about 15.5mm in height, the iKIT is a compact mobile phone with Wi-Fi and HSDPA support along with dedicated chat, email and internet capabilities. 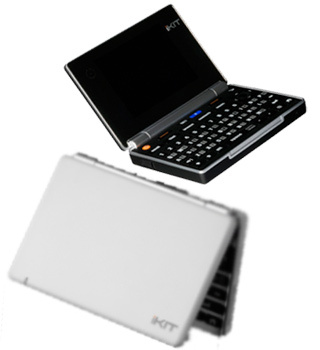 Other than fully optimized internet functionalities, the iKIT boasts of full QWERTY/AZERTY keyboard with dedicated hotkeys, a webcam, a music and video player. It is additionally attributed by a neat 2.8” QVGA display and an 8GB SD card slot that can easily pass off as a surrogate for a laptop. With effortless messaging capabilities, the iKIT is a great device while you are on the move. We think the ultra-cool and functional device should go down well with the youth and travelers as it retails at a price of just about £99 or €130.